How can I change my account data both on proDAD and Element5 (proDAD-online shop), and also relating to the newsletter? You can change the data of your account (You can change change your account data on proDAD, Element5. You can also change the newsletter settings. Please note the following hints. FAQ 1: How can I change the settings of my proDAD account on www.prodad.com? FAQ 2: How can I change my email address and the settings for the proDAD Newsletter? FAQ 3: How can I change the settings of my Element5 account (proDAD-online shop)? FAQ1: How to change the settings of my proDAD account on www.prodad.com? Register free of charge for information only and without responsability and benefit from the ample proDAD service! Click the User-Login option on the cover page of www.prodad.com. The proDAD Service Center page opens. If you register for the first time, click Click here to receive free access to the proDAD Service Center! (1). Enter your address, your email address as well as your proDAD product on the following page. Then click on Create Account. If you have already an account just click log-in (2). You can register on www.prodad.com for our newsletter. Click the Newsletter option. Now enter your data and click Submit. If you don't want to receive our newsletter any more, use the Link Abmelden (Cancel) of the last newsletter you have received. You won't receive any more newsletters. If you want to change the email address for your newsletters, please use the link Cancel of the last newsletter and re-register with your new email address on www.prodad.com. FAQ 3: How to change Element5 account settings (the proDAD-online shop, where I buy proDAD products online)? Please contact Element5 (where you have bought your proDAD product) via email : support-eng@element5.com or Tel. 0049 (0)221 3108830). Start MAGIX MX and place a video in the timeline and select it. Then open the Plug-ins-manager in the Effects (1) / Additional effects (2) register. The Plug-ins manager starts, in the Available plug-ins (3) area on the left you will find proDAD (4), double-click to see all the proDAD Effect-Plugins available, e.g. Mercalli 2.0, Vitascene and Adorage. Now select proDAD Vitascene (5) by clicking. Then click the Insert plug-in option (6) to start Vitascene. Now select an effect and apply it via F12. In thePlug-ins for the current object area (7) you will see proDAD Vitascene (8). Click OK to apply the effects. The effects will be shown in the preview. Now you can use Vitascene, Adorage or Mercalli repeatedly without changing any previously set effect. Please be mindful of the order of the effects in the Plug-ins for the current object area, because some effect(s) might be covered as a consequence of multiple use and accumulation) of effects. You can modify the order via Drag & Drop. 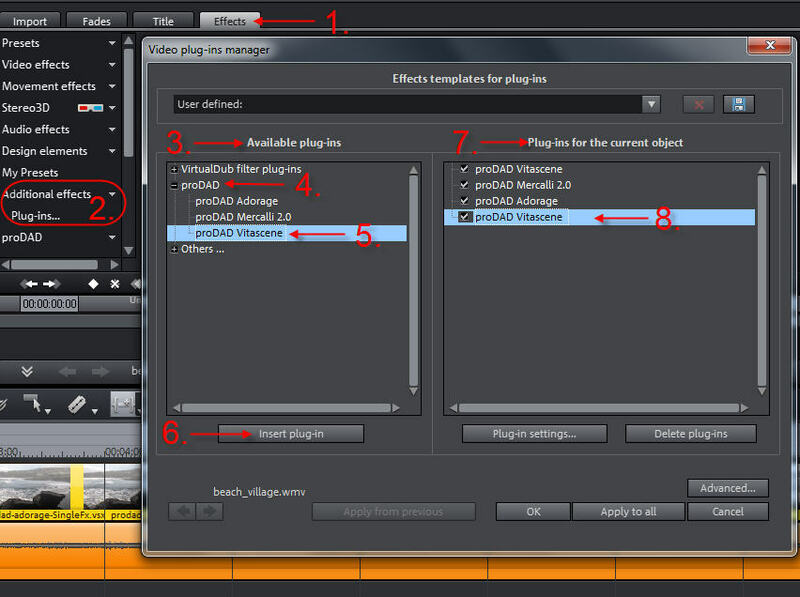 If you want to delete an effect in the Plug-ins manager, select it in the Plug-ins for the current object area and click the option Delete plug-ins to clear the effect or the plugin in the list. Effect templates from Vitascene can be used directly in Vegas Pro/Movie Studio. In case that you use keyframes, make sure that you set start and end keyframes in the Sony-Videoevent-FX dialog. 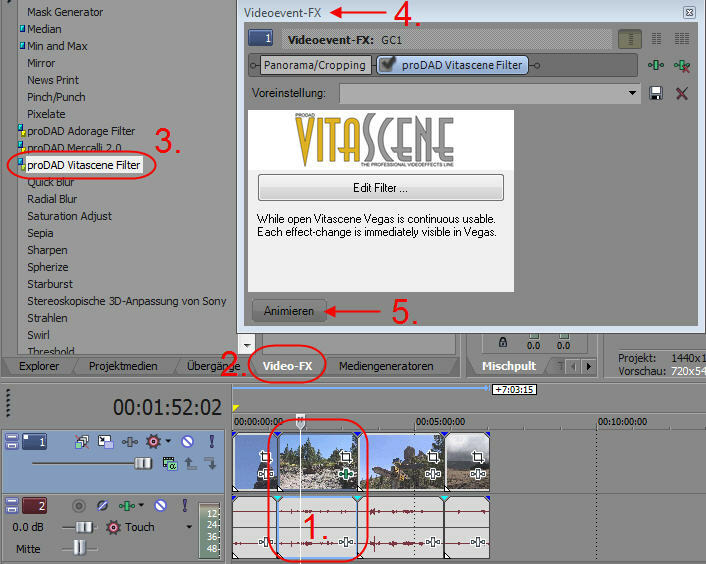 Otherwise the Vitascene-Effect (with keyframes) will not be applied in Vegas Pro/Movie Studio. Adorage effects can only be applied if you set start and end keyframes in the Sony-Videoevent-FX dialog. To animate video filters in Vegas Pro and Movie Studio it is essential to set keyframes to mark the starting point and the ending point of the animation. First start Vegas Pro or Movie Studio and place a Video (1) into the Timeline. 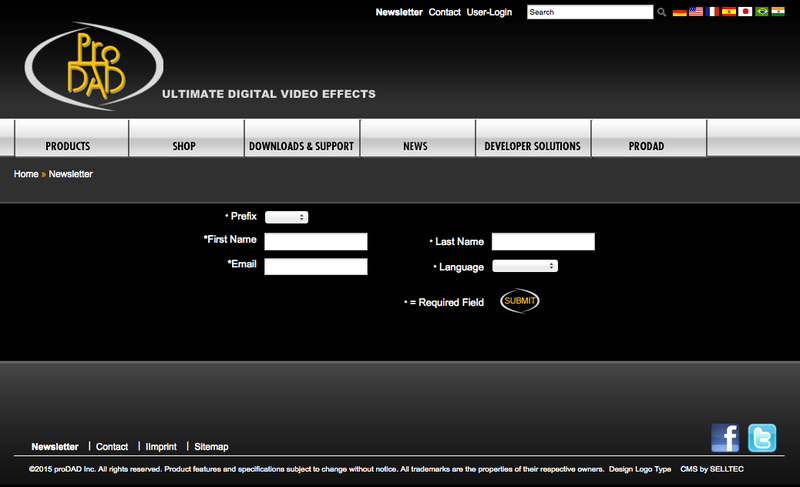 Then go to Video-FX (2) register to apply (e.g.) Vitascene (3) to your video as a video effect. The Videoevent-FX (4) dialogopens. Click Animation (5). 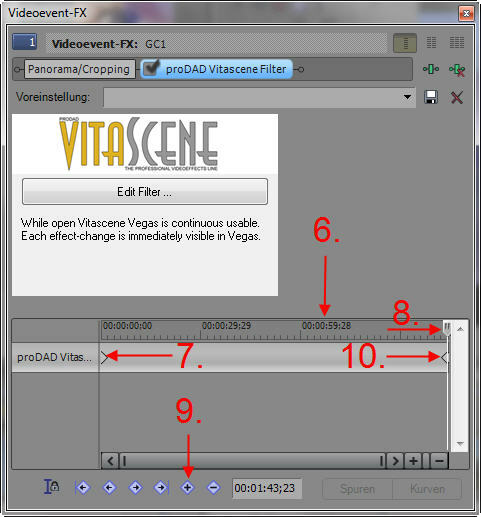 A Timeline (6) opens in the Videoevent-FX dialog. A starting point Keyframe (7) is being set automatically. Now move the Position slide button (8) to the end of the Timeline and click the option + (9). A Keyframe (10) marking the ending point will be set. Now click Edit Vitascene in the Videoevent-FX dialog. Vitascene starts. 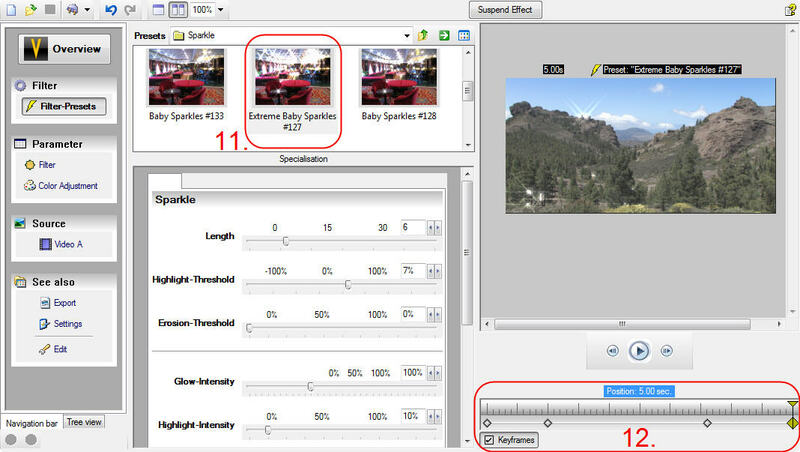 You can select an effect (11) from the effect list and you can modify various effect settings in the course of the video by setting Keyframes (12). Apply the effect by clicking F12 and then return to Vegas Pro or Movie Studio. There are no more Keyframes necessary in Vegas or in Movie Studio, you carry out all the necessary steps in Vitascene. 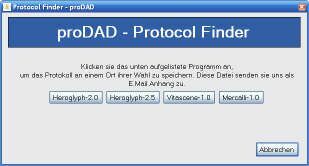 The same procedure is necessary for proDAD Adorage Effects. Make use of Sony Vegas 10 Pro and Movie Studio 10/11. proDAD Vitascene 1.0 users of bundle versions of Grass Valley EDIUS/NEO, Pinnacle Studio 11/12 Ultimate Collection as well as Magix Video deluxe and ProX can upgrade their versions without restriction to Vitascene 2.0 Pro. Vitascene 2.0 works well only in EDIUS 6 or in NEO3. Vitascene 2.0 will be activated immediately after the installation in Pinnacle Studio 14/15 as well as in Avid Studio. No further activation (unlocking) is necessary on behalf of Pinnacle/Avid. proDAD products bought in the proDAD shop can be reactivated in Element 5 up to 3 months after purchase (via email support-eng@element5.comor calling 0049 (0)221 3108830). If you purchased your proDAD product(s) more than 3 months ago, you need to buy an extended licence. Generally, we recommend to download your download products immediately after receiving the corresponding link (available in the email of confirmation sent by Element 5) or to order an additional Backup-CD or DVD. It is also recommendable to save (and to archive) the download on an external hard disc or on a CD/DVD to make sure that you have access to your proDAD software at any moment – i.e. when you need it for a new installation. Please proceed equally with Service Packs: download and archive them. Costumers with T-Online internet access may have problems while downloading. The reason is that the preset T-Online DNS Server can’t resolve the Download link, which is why the Download page isn’t found. After replacing the server with the Google-DNS server the Download will work out well. What is the difference – in terms of contents – between a bundled version and a full version, i.e. from the proDAD Onlinestore? The Plugin included in the delivery is only valid for the editing-software to which it is related. Plugins for other editing-software programs are not included and there is no legal right to claim any. The customer can order an upgrade of a bundled version to a full version at any moment. This would provide him/her with the complete support-service, free updates and all the functions for all the products. What is a bundled version of an editing program? In general terms, it is a Plugin, which is licensed for the current generation of the editing software. This means that the following versions of the editing software probably won’t support the bundled version. The technical Email-support will also be limited to the bundled product in connection with the editing software. Furthermore, there is no legal right to claim any feature-update. The user can only claim technical updates that might be necessary due to technical problems, and only for the generation of editing software included in the delivered package. In order to be able to locate (and resolve ?) problems possibly occurring in Mac computers, we need a Crash Report. When an error occurs, please start the CONSOLE (to be found in Applications/Utilities) to create a Crash Report. 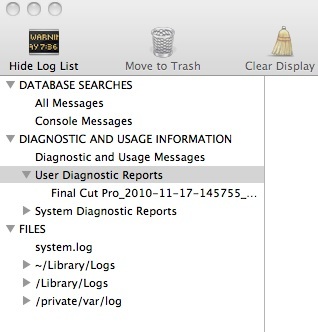 You will find the corresponding Crash Report under DIAGNOSTIC AND USAGE INFORMATION/User Diagnostic Reports (you can see an example in the screenshot). Then select the Crash Report (e.g. Final Cut Pro_2010…), and click File/Save a Copy As in the menu to save the report. Please send us this report. Incorrect serial number? Is the last digit the number zero (0) or the letter O (Oh)? If the last digit of your serial number of Adorage Volume 10 or 11 or Mercalli V2 is the number zero (0), this may be confused with the letter O (Oh).Please replace the character and the serial number will be accepted. +++ File already in use. Please close all open programs affected by this installation before continuing. (32) +++ Just close all running programs and restart the Setup again. If this not help, please restart your computer first. PS: Update your Program with the Service Pack (Link #1). The latest proDAD products are also compatible with Windows 7. But the "Desktop Composition" of Windows 7 might produce problems regarding user interfaces. This depends on the used system in combination with the graphics card and also occurs with some products of other manufacturers. Therefore we recommend to deactivate the "Desktop Composition" mode in general. How to deactivate the Windows 'Desktop Composition' mode: 1. Open Windows Explorer with Windows-Key + 'E' 2. Right click Computer > Properties 3. Advanced System Settings 4. Under Performance click Settings 5. Untick (Disable) Enable Desktop Composition 6. Apply The compatibility of programs with Windows 7 should be increased now and the system speed is a bit optimized. Get detailed compatibility information about proDAD products as plugins for Adobe Premiere CS4 and potential limitations with the use in Premiere CS4. it´s reuired to always use Premiere 4.1 in combination with the latest Servicepacks of each installed proDAD product. In Premiere make sure that the settings of the used videoclip are EXACTLY according to the settings of the used sequence. This is the only guarantee for the best quality in stabilization. In this context please check the videoclip’s format (height x width in pixel), the aspect ratio, as well as the field order setting. In addition please note that for a best possible stabilization the videoclip’s field order setting needs to be also defined manually in Mercalli. Limitation 1: Preview only Video A or Video B. Limitation 2: Preview for 16:9 Video distorted. Limitation 1: Preview only possible with untrimmed clips, else black. Limitation 2: Title can´t being created within Premiere. Needs to be created with Heroglyph standalone version and imported. Limitation 1: Can be used only on untrimmed clips. Limitation 2: The automatic field-order detection (Interlace) is impossible, therefore 'Video-Format' needs to be set manually to avoid wrong or damaged stabilisation results. 1. The above mentioned limitations are existant only in the above mentioned Version of Premiere CS 4. Earlier Versions of Premiere 4 doesn´t have these limitations. 2. The above mentioned limitations des not affect the final rendering! 3. Those limitations are always possible due to plugin interface changings or optimisations of any editing software. 4. The developments of both manufacturers are continiously working on solutions and updates. 5. In case of existant technical framework and therefore proDAD can independently create solutions, these optimisations will be integrated in the each free Servicepacks (Link see bottom). - In Heroglyph products: menu "help", "Registration"
- In VitaScene products: menu "help", "Registration"
Please do not modify the created registration-email or its subject or the recipient address. This guarantees a fast processing of your registration. Possibly you need to finally send the email by using the email clients 'send email(s)' function. Due to privacy reasons we´re not just transmitting the data directly because we´ld like to give you the possibility to see which data you´re transmitting with the registration - sounds a little bit difficultier but provides max. transparency for our customers which is our priority. The printed application you can send us by fax or postal mail. The text file also can be transferred by memory stick to an internet connected PC to send the email to info@prodad.de . - Demoversions generally can´t being registered because they don´t include whether a registration code nor a registration function. - Products especially for Pinnacle Studio needs to be registered/activated differently, for information for each product see link below. I received an email with my download link for a trial from Element5/Digital River. I try to download the demoversion and click on the link given in the email.. Error '403' or the proDAD welcome page with the language selection appears. The link you try to use is errorneous or incomplete used for download. Sometimes particularly long links are divided across two lines in an e-mail program - this means that clicking on the link will not always allow the user to navigate to the correct Website. To ensure that the download page can be accessed correctly, please highlight the entire link with your mouse, right click, and then select "Copy". Instead of using your mouse, you can also copy the link by pressing "CTRL" + "C", and then paste the link by pressing "CTRL" + "V" (Windows) and "Command" + "c" and "Command" + "v" for Macintosh. Make sure that the link does not contain any line breaks. Then paste the entire link into the address bar of your Web browser and press enter. The demoversion can´t being installed or even downloaded. What could be the reason? Getting no answers on your email? proDAD is well-known for its high standard of prompt service. That also goes for our response times to your emails. For us, it goes without saying that you, as our customer, are automatically a user of high-quality products – and thus naturally entitled to excellent service – at no extra charge of course. Unfortunately, communication channels sometimes obstruct our service. For instance, recipients of the Comcast service face difficulties in receiving any emails from proDAD at all. It is hard to understand, but nevertheless true that proDAD emails do not get through unless the subscriber deactivates the SPAM filter in the Comcast account settings of his/her email account. A troublesome consequence of this situation is the failure of emails containing final license keys for full software versions to reach their intended recipients. We also regret that download links to demo-versions cannot be sent. Quite clearly, this is a problem that we at proDAD ourselves cannot resolve. Our many enquiries to Comcast have come to nothing and it therefore appears wishful thinking to expect them to eliminate the problem... All we can do is recommend that customers check their Comcast account settings to allow trouble-free communication with proDAD. If necessary, temporarily deactivating the SPAM filter will help. The proDAD-program has installed as plugin into the NLE and appears as effect but it can´t be used. Please note: Sometimes Mercalli, Heroglyph, VitaScene etc. can also install into host applications which are not part of the plug-in compatibility list. In the majority of cases it´s about previous versions of editing solutions, such as Adobe Premiere 6 Canopus Edius 3.x Pinnacle Liquid 6 Sony Vegas 5 and others and previous ... In those cases the use as plug-in is just impossible because these older generations or better their plug-in interfaces doesn´t provide needs which are required by the plug-in. The only possible remedy is to keep the nonlinear editing software (NLE) up-to-date and to use proDAD products as plug-in there. Reliable compatibility information we always offer on the each product website at www.prodad.com . Please send an e-mail to proDAD. We would like the application protocol to help quicke. How do you find the protocol-file ? A little Tool will list all protocols on your system. How to use: Start the little Tool (Link #1) and send us the .gz file. Problem: If the tool not starts, please install Microsoft NET 2.0 (Link #2). Note: Ideally you will send us your request by program-menu "Help", in case of problems send an email .... Then the installation and user protocol is also sent to us automatically as a zip file. You do not need to do anything else. By the way, the transferred data does not include any personal information. Trying to install a downloaded Demoversion or Fullversion results in an Error message like "Win32 - no valid Windows Application"
This error typically occures in case of incomplete downloads. The one and only solution: try to download again. Ideally please use a Downloadmanager such as Getright or Flashget. Those tools can complete broken downloads until the file is dowloaded completely.